Stainless Steel Version Offered with Extra Check Weighing Mode The 304 stainless steel Valor 2000s provide an extra layer of protection, as well as an additional checkweighing mode. 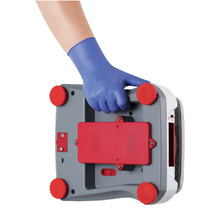 This ruggedly durable and easy to clean model enhances the scales usability for all checkweighing applications, including sorting, portioning, and quality assurance. Check Weighing (V22XW only) ? Use the bright red/yellow/green LEDs to easily fill containers and packages by weight -- great for sorting, grading and portioning.